Sanifit received a grant in the latest call of the Torres Quevedo program by getting the second best national rating. Torres Quevedo grants belong to the State Program for the Promotion of Talent and Employability in R+D of the Spanish Ministry of Economy and Finance. Its aim is to encourage the hiring of doctors by companies and other research centres to develop industrial research projects. Sanifit is dedicated to the development of therapeutic solutions for the treatment of diseases related to calcium. Specifically, SNF472 is an experimental drug for the treatment of cardiovascular disease in haemodialysis patients. The first indication for SNF472 is the treatment of calciphylaxis, a rare disease affecting between 1 and 4% of dialysis patients, with an average life expectancy of 1 year from diagnosis. Sanifit received orphan drug designation for SNF472 (from EMA and FDA) and has already completed all Phase I studies in healthy volunteers. As a consequence of receiving the Torres Quevedo grant, Dr. Canals has joined the Sanifit team as Project Manager for preclinical and clinical activities. Sanifit presented SNF472 preclinical data at the ASN Kidney Week 2014 in Philadelphia, PA.
Sanifit Laboratories reached high expectation after presenting preclinical results with its intravenous SNF472 compound. Both in vitro and in vivo results were presented. An in vitro study evaluated the binding kinetics of SNF472 on hydroxyapatite. SNF472 is quickly bound to hydroxyapatite crystals and shows a moderately slow release which allows every other day administration, a comfortable dosing schedule for dialysis patients, who would only be treated 3 times per week, when receiving the dialysis session. These results are compatible with the efficacy found in vivo, where SNF472 showed a dramatic reduction of cardiovascular calcification in heart and aorta in a well-established animal model. This efficacy was maintained when dosing SNF472 daily or every other day. Sanifit has accomplished a series B capital increase of 3.6 million Euros in an operation led by “la Caixa”. The venture capital firm HealthEquity, the company Somtobir, and the Nefrona Foundation were also involved in this round. The entrance of a group of private investors with extensive experience in the field of life sciences, among which are several ex – Phadia managers, is also worth mentioning. 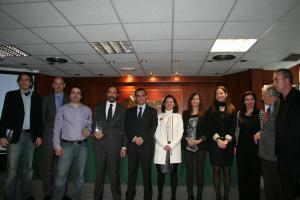 It is the largest financing round of 2014 in the biotechnology sector in Spain. Laboratoris Sanifit is dedicated to the development of therapeutic solutions for the treatment of diseases related to calcium. Specifically, SNF472 is an experimental drug for the treatment of cardiovascular disease in haemodialysis patients. This product has already completed all Phase 1 studies in healthy volunteers and is about to start trials in patients. This capital will allow Sanifit to take the project to the next phase of development, a phase 1b / 2a clinical trial to be run at the Hospital Clinic of Barcelona with dialysis patients. Laboratoris Sanifit, a company located in the ParcBIT in Mallorca, is leading a consortium of public-private cooperation’s to develop the experimental drug SNF472 in a Phase 1b/2a clinical trial. The project has the support of the Hospital Clinic in Barcelona, a centre where the Phase 1b/2a clinical trial in dialysis patients will take place, and of Son Llatzer Hospital, a centre that has been working with Sanifit since 2012 and whose contribution to the development of in vitro dialysis models is key to the project. Sanifit started a Phase 1a clinical trial in 2014 for SNF472 in London. The study involving healthy volunteers has finished and has very promising results. In December, the Phase 1a study with dialysis patients will be completed. Immediately after the Phase 1a finishes, the Phase 1b/2a will begin in the Hospital Clínic in Barcelona. In parallel, various in vitro and in vivo studies will be performed, involving the three entities, as they have received nearly one million euros in funding from MINECO, one of the largest RETOS research projects that have been awarded in this funding call, intended to finance innovative projects that represent challenges for society. The first indication for SNF472 is the treatment of calciphylaxis, a rare disease affecting between 1 and 4% of dialysis patients with an average life expectancy of 1 year from diagnosis. Calciphylaxis originates from massive cardiovascular calcifications in the small, peripheral blood vessels and there are currently no approved, alternative treatments. Sanifit received orphan drug designation for SNF472, from EMA and FDA. Sanifit Laboratories received authorization from the MHRA and the ethics committee to initiate Phase I studies in London. These tests, which began last month, evaluate in healthy volunteers and dialysis patients, the safety, pharmacokinetics and efficacy of SNF472, the experimental drug for the treatment of calciphylaxis, which has demonstrated an excellent safety-efficacy profile in different animal models. Calciphylaxis is a rare disease with a high mortality rate (over 80 %) that affects between 1 and 4% of all dialysis patients, with an average life expectancy of 1 year from diagnosis and a huge impact on the patient’s quality of life. Calciphylaxis has its origin in the massive cardiovascular calcification of small peripheral blood vessels and there are currently no approved alternative treatments. Sanifit received orphan designation for SNF472 by the EMA and the FDA. The company licensed its first product in 2013, based on the same scientific principles against calcification, at one of the major pharmaceutical companies, to treat dental calcification (plaque) through its use in toothpastes and mouthwashes. Sanifit Laboratories is a Spanish biopharmaceutical company headquartered in ParcBIT, and has been involved since 2007 in the discovery and development of compounds against diseases related to calcification of tissues and organs. Since its beginnings, Sanifit has been financed by venture capital instruments of “La Caixa”, and the company has Caixa Capital BioMed and several private investors (business angels), as investors. The Confederation of Business Associations of the Balearic Islands (CAEB) awarded SANIFIT, in its second edition CAEB Business Innovation Awards. – For the development of an experimental drug for the treatment of cardiovascular disease in patients with renal failure treated with dialysis. Other companies awarded were Biloop, Quercus Energy and Bessensor.